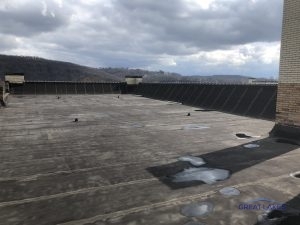 When you are searching for a commercial commercial roofing company that you can rely on no matter what, look no longer because Great Lakes Commercial Roofing is here for you. Our roofers are certified, trained, licensed, and experienced so you have peace of mind. We want only the most for you and that is what you will have over and over. We make sure that we are aware of all commercial roofing methods so that you always have what you want. We want to make certain that we are excellent at commercial roofing and that is why we decided on this specialty. We value and take so much pride in how we run our customer service and the quality of work we provide. Because of that, we have 24/7 services so that you never feel like you have to wait to get something done during a pinch. We are there for you in 24 hours if there is ever a problem with a roof that we have worked on. If you have an issue with your roof, we get it fixed right away. If you want a dependable commercial roof, call our team at 412-256-8050. Metal Roof Coatings Metal roof coatings are a good way to stay away from stuff like rust and needing to get your roof replaced. 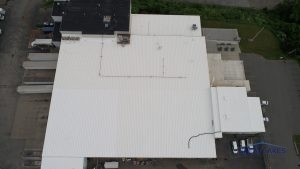 Industrial Roof Coatings A roof coating should be able to continue your industrial roof working and moving smoothly for many more years of protection. 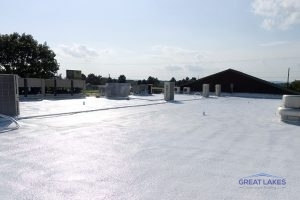 A roof coating on your commercial roofing system is a good decision to make. A roof coating will ensure that your roof lasts as long as possible and keeps it looking great. From flat roofing to metal and industrial, we offer a coating for them all. Every roof coating does something different, but they all can add around 10 years extra of life to your roof. It is important that you know that at Great Lakes Commercial Roofing, we stay up to date on learning all the latest roofing technology. Roof coatings are easy to install and are typically pretty fast to have installed as well. We consistently do anything we can to not disrupt your business and are courteous when we are working. Roof coating questions in Glassport, PA, are just a phone call away when you call 412-256-8050. If you have been wondering about an estimate, call us, it’s free. Commercial Roof Repair A roof repair has to be done to make sure that no more damage happens on your roof. This can be done by one of our professionals. Commercial Roof Installation With a team of experienced professionals, your commercial roof will be worked on right away. Commercial Metal Roofing Metal roofing can give your commercial roofing system the toughest protection and some metal roofs will even last up to 70 years. A top choice that you can choose is a PVC roofing system. Although there are pros and cons to each material you have, PVC roofing is a top quality product that can last the test of time. 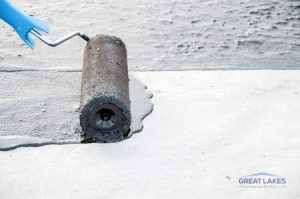 Your flat roof will get at least 10 years out of this product and can possibly last up to 50 years if it is taken care of correctly and weather conditions are good. It comes in a giant roll that is put on your roof and leaves it completely smooth. It will keep your roof safe from moisture, fires, and is extremely durable. There are many more reasons, but because of that and it being so economical, it has become very popular. If you want to repair your roofing system and not have to get a new one, a roof restoration is a good choice. Commercial roofs may become worn down because of weather and have serious damage in different spots. We can decide if you will need to replace your roofing system or if you are able to restore it. Once you have a professional roofer come out to look at the roof, they are able to decide if it can be restored or not. Getting your roof restored is more economical and is actually better for the environment. When you get your roof taken off to get a new one, it gets sent to landfills and ends up adding pollution to the earth. A roof restoration will allow you to keep your roof and make it be new again. 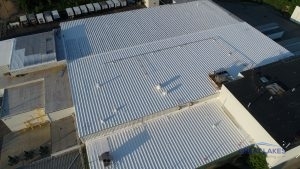 Commercial buildings are prime candidates for metal roofing systems. To have your metal roof working as long as it can, it will need to have normal maintenance done to it. A popular option that works good for metal roofing is to use a roof coating. A roof coating on your metal roofing system can help to keep it from getting water damage. Water on metal roofing can eventually turn into rust that will eat away at the metal, making damage and even holes in the roof. 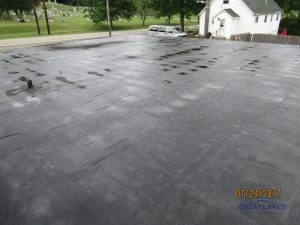 A roof coating will add 10 additional years of life onto your roof and keep away rust and water damage. Keep your metal safer better than ever before and get an unbeatable value. Flat roofs biggest problems are that they tend to gather water and often times get water damage because of it. That is a big thing you will need to pay attention to because elseways your flat roof can become damaged. Spray foam becomes sealed and will keep out water. This roofing is the only one that is completely seamless and will keep water out. One thing you might not know is that this material is strong enough to stand on. Our experts know how to install this material through years of experience and make certain to build it up in certain areas so that water does not sit in one place and cause damage. When you want spray foam roofing in Glassport, PA, call 412-256-8050.